As shown in the picture of the recent update on the SLL website. It is showing a clear picture of 'Sir Keith Park" boiler which is showing the location of the Safety Valves. I was under the impression that Bulleid Boilers had 3 safety valves alongside one another and not 2 and then 1 further down? I hope someone can clarify this for me? Hopefully if Nick see's this he will upload a photo for us? Andy, the photo on the SLL News (taken by yours truly) is of the old position of safety valves. I assume SKP's boiler is the same as all the others. The three blanks are two in parallel and one immediately behind. I believe that from c-1952 onwards these were replaced by two safety valves further back, but I don't have a photo to demonstrate that. If the access gantries are suitably positioned next time I am there (14-15 April) I will take a photo. 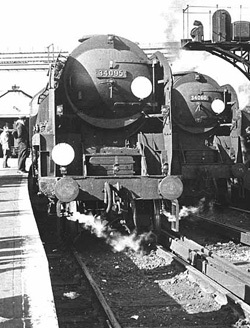 I have just seen this Photo on the Clanline website (3/4 of the way down) showing 3 Safety Valves together and which looks like the Regulator Dome just on front. Can we upload you're picture please Nick so to show others for a comparison? 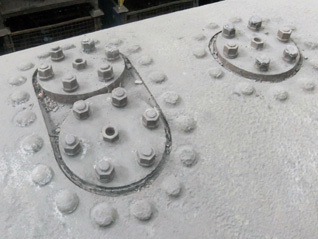 Here's the photo showing the blanks on top of Sir Keith Park's boiler. With the recent updates and looking at other boilers that have had new platework etc..... It got me thinking when is a boiler classed as in-repairable? i.e, can you just keep adding new platework and welding new pieces onto Boilers? Hope this doesn't sound too silly? 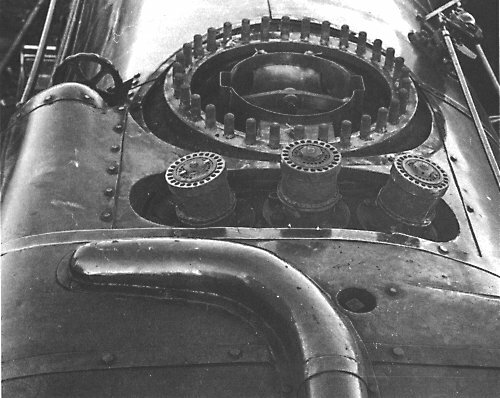 I was just looking at Clanline's boiler at all the new parts. My understanding is that any individual section can be repaired or replaced, however if you took an old boiler completely apart it would be extremely difficult to reassemble it. e.g. it's quite common to replace the front or rear tubeplate, but if you removed both the boiler would lose its shape and be very difficult to rebuild. Maybe someone with more direct boiler experience would care to elaborate on or correct my comments. What is the reason and difference between the 2 and 3 safety valve arrangement?